Worried about your car being stolen or broken into? You might be surprised to learn that it’s not the high-dollar cars that are most at risk. Car theft statistics show that Honda Accords top the list nationwide, followed by Ford Pick-Ups, Honda Civics and the Toyota Camry1. What’s one of the easiest and cheapest ways to protect your vehicle? A steering wheel lock can be a huge deterrent. Our review gives you a lowdown of the best steering wheel locks, as well as tips on how to prevent car theft and break-ins. 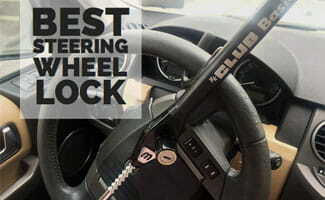 To find out what we’ve ranked as the best steering wheel lock for a specific category choose one of the topics below. Or, if you’d like to learn about them all simply scroll through the page. The Club anti-theft device first hit the consumer market in 1986, and nearly two decades later it still dominates. Although there are now a number of different Club products, The Club Original 1000 has maintained its status for years, and it’s hard to beat. The combination of simplicity, sturdiness, security and affordability make this product our choice for the best overall steering wheel lock. Yes, it’s comparatively expensive, but the FJM High Security Steering Wheel Lock with Air Bag Protection Plate takes anti-theft car security to a higher level. First, this lock is built to withstand multiple cuts to the steering wheel – one of the easiest ways thieves disable steering wheel locks is by sliding them off the cut steering wheel. The FJM Lock also prevents thieves from inserting a smaller, replacement steering wheel – another way professional thieves steal cars. A top seller, the SVAT AUTOLOCK200 is popular for its ease of use and affordable price. When you park, all you have to do is snap the steering wheel lock in place and it self-locks. The AUTOLOCK200 fits many models of cars, pickup trucks, SUVs and minivans and has an adjustable arm that extends to fit up to 16″ diameter. It’s made of solid steel that’s virtually impossible to saw, drill, hammer or pry apart. It’s not the best steering wheel lock out there, but if your budget is limited, consider the AUTO LOCK 200. Although many steering wheel locks claim to be a universal fit, the truth is some simply don’t fit the steering wheels of larger pickup trucks and SUV’s. Here’s where The Club, yet again, delivers ahead of the pack. The Truck SUV Club device is our top choice for larger passenger vehicles due to its impressive features, safety measures and ease of use. The National Insurance Crime Bureau (NICB) recommends a “layered approach” to preventing car theft. The more layers of security you have, the harder you make it for criminals to steal your vehicle. Layer 1: Use common sense. Don’t leave your car when it’s running; park in a well-lit area. Layer 2: Use warning devices, such as a steering wheel lock, an audible alarm or window decals. Layer 3: Install an immobilizing device. A number of car theft prevention devices, like kill switches or smart keys, prevent thieves from bypassing your ignition and hot-wiring your car. Layer 4: Employ a tracking device that gives you and the police the ability to locate your car if it’s stolen. According to a FBI crime report, there were nearly 700,000 motor vehicle thefts in the United States in 2013, and 73.9% of these were passenger vehicles. If you live in an area prone to car thefts and break-ins, why not consider using a steering wheel lock? The relatively low cost could end up giving you greater peace of mind and saving you thousands of dollars in the long run. Do you use a steering wheel lock? Have you or someone you know found it an effective deterrent?